Waterbury Clock Co., "Calendar No. 43", ca 1912. 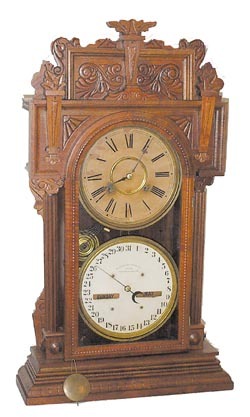 This clock is almost identical to the Waterbury "Niagra", where the calendar is on the upper dial. 3 labels on the back of the case, hands, pendulum , are correct. 8 day movement strikes half hours on a cathedral gong and runs just fine. Dials are signed and original. Colors are different but the type and weight of the paper is different. One yellowed, one stayed white, but both put on at the same time. 28 inch oak case has had a light cleaning, not refinished. Now an old oak, almost walnut shade. Ly-Calendar No.767.